First Donald Trump told us that this healthcare thing was complicated. Now Mitch McConnell has told us that healthcare is a complicated subject. I wonder, who will be the next one? One thing that makes it more complicated, of course, is trying to do it with two hands full of Republican men behind closed doors. McConnell says he remembers how tough it was for the Dems to get the Affordable Care Act implemented in the first place, and while the record shows that there were both public hearings and behind closed doors sessions to get the bill to passage, it seems like McConnell is doomed to repeat the history that he so closely watched. Reports out today said the majority leader is going to get another version of the bill to the CBO before the holiday break. While the legislation is likely to undergo further revisions after this next update, McConnell is trying to move quickly to produce a new CBO score by the time lawmakers return to Washington in mid-July. That would give the Senate about two weeks to fulfill the majority leader's goal of voting before the August recess. As all that's going on, the news tonight was filled with the faces of Republican senators suggesting that sitting down with Democrats might actually be the trick to getting the bill passed. The president has said as much himself, but I don't have to wonder who was being sincere - the senators or the president? And, with multiple polls showing a resounding lack of support for the Republican bill, it could be a long break for Senators at home. Separate surveys from NPR/PBS Newshour/Marist, USA Today/Suffolk University and Quinnipiac University - all released on Wednesday - show fewer than one in five voters back the GOP push to repeal and replace Obamacare. I wonder if I know even that many who support it? And speaking of the president, as it seems I do most Wednesdays, did you hear about someone hanging fake news featuring his likeness in several of his resorts? ? Seriously! 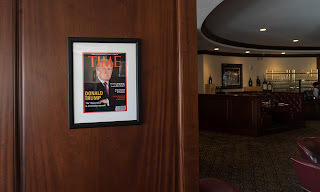 In at least five of his resorts, there's a fake Time magazine cover with Trump as the subject. Fake headline, exclamation points and all, someone mocked up the fake and someone framed them and someone hung them up, without the knowledge of Trump himself, I can only assume. Because he would never do that, right? John Barron maybe, but not Trump. He would never do that, never order that, never even think of that! Trump would never think of holding a campaign fundraiser in his own hotel, either, right? I mean, he did that when he was a candidate, of course. And raised the price, once the RNC started picking up the bills, enriching his company's - and therefore his own and his family's - coffers. But that would unethical, now that he's president, right? Wrong. Trump, who filed his papers for the 2020 election on Inauguration Day (and likely fought off millions of supporters to do so), is holding his first fundraiser less than six months after taking office. At his own hotel. In keeping with this theme, Trump will be officially kicking off his reelection bid with a major fundraiser (June 28th), less than six months into his first term... Trump is holding his first fundraiser in the Trump International Hotel in Washington DC, which he has refused to give up ownership of while in office. That ensures that every advertisement for (and article about) the fundraiser doubles as a promotion for the hotel, and likely means that those attending will be spending money that goes to his company, the Trump Organization. And then, of course, I wonder why I wonder whether this man has any ethics at all? And I wonder why I wonder why so many people don't seem to care about that.